As a project manager, you must find the right processes and tools to help you and your team deliver projects within the specified requirements. With the right tools in place, you can focus more on managing the project and delivering quality end products, and less on managing the process. We’ve pulled together the top project management tools that successful project managers use to plan, track, and manage their projects. You’ll also find helpful resources, best practices, and templates for you to start using these tools to manage your next project. With any project, time is important. But as complexity increases, sticking to timelines is even more critical. This makes it even more important for project managers to be able to accurately estimate how long a task will take, and if there are any dependencies to completing each task. This is where the Program Evaluation and Review Technique (PERT) developed from. PERT is often used with one-off projects where time is more important than cost. PERT work is represented in a chart or diagram that provides a visual into all scheduled tasks in a project sequence. Project managers can then analyze how much time it will take to accomplish each task, and then forecast the overall project timeline. The Kanban board is most commonly used for the Kanban project management methodology to visualize and track work being done (or needing to be done). It acts as the information hub for all task status and progress, since you can view all items on a single board. 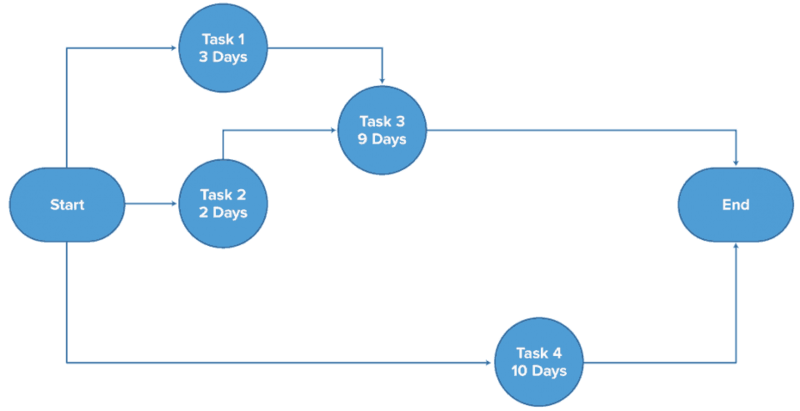 Tasks move across the board from left to right through the different stages of a workflow. Although, typically for Kanban, this easy to set up tool can be overlayed to current processes and workflows. When setting up your Kanban board, you will have (at the very least) the following three columns: To-Do, Doing, and Done. From there you can add any additional columns that align with stages of your project or workflow. Do you need real-time access to status? Will you have multiple team members working on the same project? Are your team members all located in the same office space? Will you need to share your Kanban board with external stakeholders? Depending on your answers to the previous questions, you may want to consider an online Kanban board that will enable you to share your board with all stakeholders no matter where they are located, and collaborate on project task in real time. A Gantt chart is a visual timeline that makes it easy to see how a project is progressing. Project tasks are organized on a horizontal bar chart that shows task durations, dependencies, and milestones. 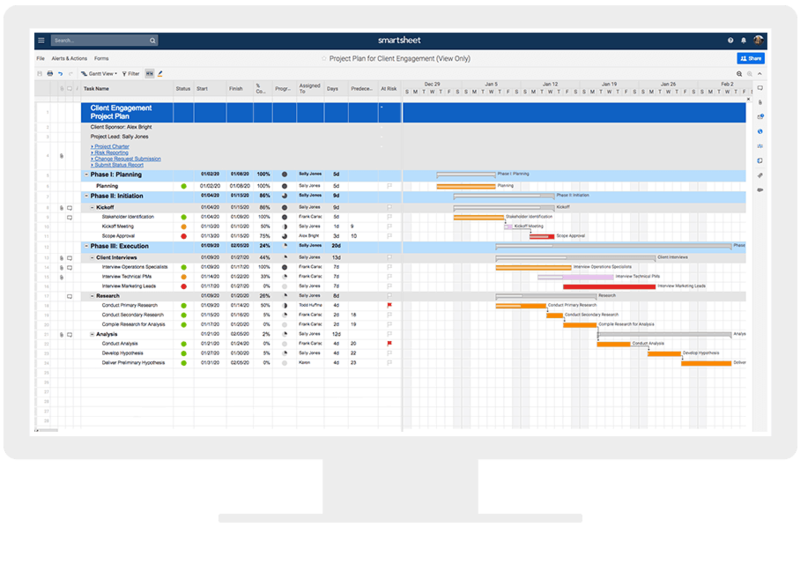 With a Gantt chart, you can plan out all of your tasks, making complex projects manageable. Know when tasks need to be completed. Keep your team informed on progress. Will it integrate with your daily workflow? Is it easy to create and update your Gantt chart? Does it provide real-time updates when changes are made to the schedule? Is the Gantt view customizable? Can you view and update your chart on different devices (i.e. desktop vs. mobile)? Is it easy to share your Gantt chart with your team? The answers to the above questions will help determine the right platform to use for all of your Gantt chart and project needs. Depending on the size and type of your project, it may require you to manage hundreds of tasks and dozens of dependencies, which can make it tricky to identify the most important tasks — the ones that, if missed, could send your project over schedule. That’s why it’s essential to have the right tools in place to identify the critical path for your project. Identifies the Most Important Tasks: It clearly identifies the tasks that you will have to closely manage. Helps Reduce Timelines: When critical path is displayed on your project timeline, it provides a new level of visibility to determine where you can make adjustments. Compares Planned with Actual: Using the baseline schedule developed from the initial critical path analysis can help track schedule progress. Below, Dr. Larry Bennett, a civil engineer, project manager, and author of four books, explains how to calculate the critical path for a simple project. Originally created as hand-drawn diagrams, you can now automatically identify critical path within most online project management software. Be sure that your software allows you to overlay your critical path to your project timeline Gantt chart, and is easy to turn on or turn off. 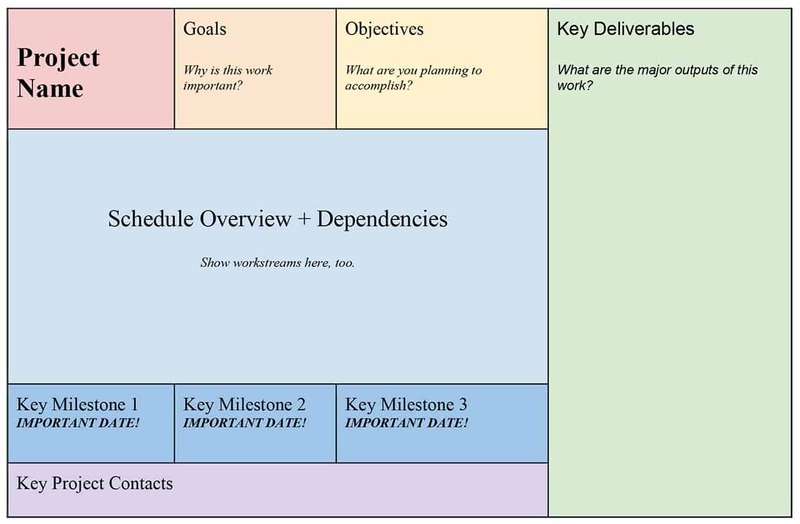 To create your work breakdown structure, you start with the desired outcome, which you then break down into the smaller deliverables or tasks. The deliverable can be a physical object, a service, or an activity. The project roadmap is a key, visual tool to quickly convey the overall project purpose and plan. Your project roadmap is a high-level, easy-to-understand overview of the important pieces of your project. It’s a helpful resource that you can share with stakeholders to provide a quick snapshot of what the project aims to accomplish, important milestones, key deliverables, dependencies, and possible risk. High-level project overview: Be succinct and concise when documenting your goals and objectives. Aim for a few sentences at most. Schedule overview: Provide a high-level view of the timeline. Don’t worry about including too many details: simply link to the project plan from your roadmap. Key milestones: Highlight a few important dates. This quick view into milestones will help set expectations with less-involved stakeholders. Dependencies: Show important deliverables and how they contribute to project success. Key contacts: Identify the go-to people on your project team, what their focus is, and how to get a hold of them. Additionally, to be effective, your project roadmap should be updated frequently — ideally in real time. This ensures that stakeholders are looking at the most up-to-date information, and will reduce the number of requests you receive for real-time updates.